Plan de Paris en 1861 Divise en 20 Arrondissements. A highly appealing 1861 tourist pocket map of Paris by J. N. Henriot. Covers the walled center of Paris as well as the immediate environs including the 14 ring forts. Reflects the transformation and modernization of Paris under Napoleon III and Georges-Eugène Haussmann. 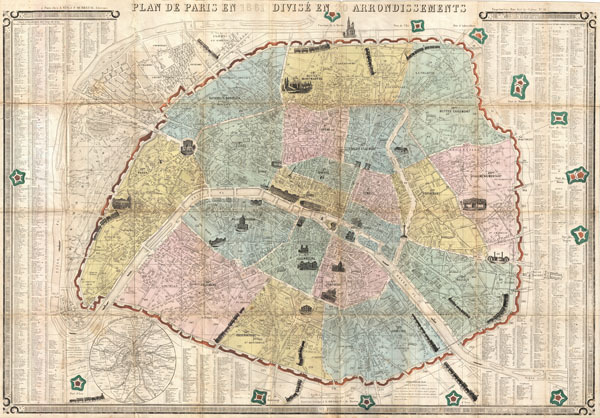 The arrondissement system is here restructured, according to the 186o plan, with the original 12 being repartitioned into 20 distinct zones. Haussmann's broad avenues and thoroughfares also make their first appearance here. Throughout important buildings are drawn in profile. Trains entering and leaving the city are also thusly illustrated - a charming embellishment. A detailed street index, with most major and minor streets identified, appears to the right and left of the map proper. Several small boats ply the Seine. A circular map of the Environs of Paris appears in the lower left quadrant. Keyboard style border with decorative flourishes at each of the four corners. Prepared by J. N. Henriot for F. Dubreuil in 1861. J. N. Henriot (fl. c. 1849 -1871) was a Paris based engraver and printer. Henriot worked in conjunction with A. Bes and F. Dubreuil, as well as other publishing firms of the day, to produce a number of widely distributed and popular maps of Paris and its environs. Like many French engravers of this period, little is known of his personal life and work. Very good. Original folds exhibit some wear and minor toning. Vallee, Leon, Catalogue des plans de Paris et des cartes de l'ile de France, Bibliotheque Nacionale, 1941 (Ge FF 10938). American Geographical Society Library, University of Wisconsin-Milwaukee Libraries, (AGS) (RARE) 630-d.P37 A-1851.